Thomas Edison invented light bulb, movie camera, carbon microphone, electric power distribution, phonograph, quadruplex telegraph and mimeograph. 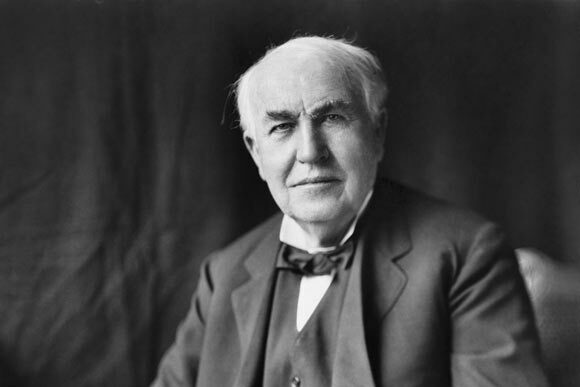 The name of Thomas Alva Edison needs no introduction. He was one of the greatest inventors of the 20th century with a staggering 1,093 inventions patented to his name. Born in Milan, Ohio in 1847, Edison suffered from scarlet fever as a child which led to severe hearing impairment. He received very little formal education and only stayed in school for 12 weeks. His teachers labeled him as a difficult and distracted child, so his mother pulled him out of school and educated him at home. Edison grew up reading a wide variety of books as he pleased, which cultivated independent thinking and objectivity in him and contributed to his enormous success as a scientist and inventor. He credits his mother as being the most important influence and driving force in his life. Edison was resourceful and eager to learn from the very beginning. He read the classics, English literature, world history, poetry, physics, chemistry, mathematics and practically anything he could get his hands on at the local library. His parents hired a private tutor to teach him physics and mathematics. At age 12, Edison got a job selling newspapers and snacks on the local railroad and also set up another business selling fruits and vegetables. At age 14 he started his own newspaper publication and used the additional income to set up a chemical laboratory in the basement of his house. While working on the railroad, he also began conducting experiments in the train carriages. During this time, he saved the life of a 3 year old child and the child’s father repaid Edison for his kindness by teaching him Morse code and how to use the telegraph. This skill led to his first invention called an “automatic repeater” which was a device used to transmit and decode telegraphic signals at the user’s convenience. Due to his family’s poor financial situation, Edison moved to Boston to work as a telegrapher with Western Union. Here he invented an electric vote recording machine but the invention had little appeal when he tried to market it. During this time, he also became well acquainted with other inventors such as Alexander Graham Bell and Benjamin B. Redding. He then moved to New York to try his luck at making his fortune, when a fortuitous coincidence led him to meet the manager of a local brokerage firm who was in a panic because of a broken stock ticker. Edison fixed the broken instrument on the spot and was immediately offered a prestigious position as a repairman at a salary of $300 per month, almost twice the going rate for such jobs. He continued to work and experiment and soon sold a stock ticker device to one corporation for $40,000 which provided him with the money he needed to conduct experiments. His list of inventions is varied and includes, amongst other things, the phonograph, carbon telephone, practical electric lamp, electric generator, motion picture camera, alkaline battery, electric power meter and even a method of preserving fruit. He set up an industrial research facility in Menlo Park and is sometimes referred to as the “wizard of Menlo Park” as well as one in West Orange, New Jersey. He achieved wealth, status and fame and was the founder of the world renowned “General Electric” company. He suffered some financial setbacks as well, such as his venture into mining iron ore, but his success far outweighed this. He even dabbled in trying to build an electric car. Thomas Alva Edison was awarded a medal of honor by the US Congress in 1928. He was married to a woman named Mina Miller and fathered three children. His health rapidly declined in the last stages of his life and he died at age 84 in Glenmont but his legacy as an inventor, businessman and a cultural icon still lives on.